The Norse settlements in the North American island of Greenland lasted for almost 500 years. L’Anse aux Meadows, the only confirmed Norse site on the North American mainland, was small and did not last as long. While voyages, for example to collect timber, are likely to have occurred for some time, there is no evidence of any lasting Norse settlements on mainland North America. A map of the Eastern Settlement on Greenland, covering approximately the modern municipality of Kujalleq. Eiriksfjord (Erik's fjord) and his farm Brattahlid are shown, as is the location of the bishopric at Gardar. According to the Sagas of Icelanders, Norsemen from Iceland first settled Greenland in the 980s. There is no special reason to doubt the authority of the information that the sagas supply regarding the very beginning of the settlement, but they cannot be treated as primary evidence for the history of Norse Greenland because they embody the literary preoccupations of writers and audiences in medieval Iceland that are not always reliable. Erik the Red (Old Norse: Eiríkr rauði), having been banished from Iceland for manslaughter, explored the uninhabited southwestern coast of Greenland during the three years of his banishment. He made plans to entice settlers to the area, naming it Greenland on the assumption that "people would be more eager to go there because the land had a good name". The inner reaches of one long fjord, named Eiriksfjord after him, was where he eventually established his estate Brattahlid. He issued tracts of land to his followers. Norse Greenland consisted of two settlements. The Eastern was at the southwestern tip of Greenland, while the Western Settlement was about 500 km up the west coast, inland from present-day Nuuk. A smaller settlement near the Eastern Settlement is sometimes considered the Middle Settlement. The combined population was around 2,000–3,000. At least 400 farms have been identified by archaeologists. Norse Greenland had a bishopric (at Garðar) and exported walrus ivory, furs, rope, sheep, whale or seal blubber, live animals such as polar bears, supposed "unicorn horns" (in reality narwhal tusks), and cattle hides. In 1126, the population requested a Bishop (headquartered at Garðar), and in 1261, they accepted the overlordship of the Norwegian King. They continued to have their own law and became almost completely independent after 1349, the time of the Black Death. In 1380, the Norwegian Kingdom entered into a personal union with the Kingdom of Denmark. There is evidence of Norse trade with the natives (called Skraelings by the Norse). The Norse would have encountered both Native Americans (the Beothuk, related to the Algonquin) and the Thule, the ancestors of the Inuit. The Dorset had withdrawn from Greenland before the Norse settlement of the island. Items such as comb fragments, pieces of iron cooking utensils and chisels, chess pieces, ship rivets, carpenter's planes, and oaken ship fragments used in Inuit boats have been found far beyond the traditional range of Norse colonization. A small ivory statue that appears to represent a European has also been found among the ruins of an Inuit community house. The settlement began to decline in the 14th century. The Western Settlement was abandoned around 1350, and the last bishop at Garðar died in 1377. After a marriage was recorded in 1408, no written records mention the settlers. It is probable that the Eastern Settlement was defunct by the late 15th century. The most recent radiocarbon date found in Norse settlements as of 2002 was 1430 (±15 years). Several theories have been advanced to explain the decline. The Little Ice Age of this period would have made travel between Greenland and Europe, as well as farming, more difficult; although fishing and seal hunting provided a healthy diet, there was more prestige in cattle farming, and there was increased availability of farms in Scandinavian countries depopulated by famine and plague epidemics. In addition, Greenlandic ivory may have been supplanted in European markets by cheaper ivory from Africa. Despite the loss of contact with the Greenlanders, the Norwegian-Danish crown continued to consider Greenland a possession. Not knowing whether the old Norse civilization remained in Greenland or not—and worried that if it did, it would still be Catholic 200 years after the Scandinavian homelands had experienced the Reformation—a joint merchant-clerical expedition led by the Dano-Norwegian missionary Hans Egede was sent to Greenland in 1721. Though this expedition found no surviving Europeans, it marked the beginning of Denmark's re-assertion of sovereignty over the island. Norse Greenlanders were limited to scattered fjords on the island that provided a spot for their animals (such as cattle, sheep, goats, dogs, and cats) to be kept and farms to be established. In these fjords, the farms depended upon byres to host their livestock in the winter, and routinely culled their herds in order to survive the season. The coming warmer seasons meant that livestocks were taken from their byres to pasture, the most fertile being controlled by the most powerful farms and the church. What was produced by livestock and farming was supplemented with subsistence hunting of mainly seal and caribou as well as walrus for trade. The Norse mainly relied on the Nordrsetur hunt, a communal hunt of migratory harp seals that would take place during spring. Trade was highly important to the Greenland Norse and they relied on imports of lumber due to the barrenness of Greenland. In turn they exported goods such as walrus ivory and hide, live polar bears, and narwhal tusks. Ultimately these setups were vulnerable as they relied on migratory patterns created by climate as well as the well-being of the few fjords on the island. A portion of the time the Greenland settlements existed was during the Little Ice Age and the climate was, overall, becoming cooler and more humid. As climate began to cool and humidity began to increase, this brought longer winters and shorter springs, more storms and affected the migratory patterns of the harp seal. Pasture space began to dwindle and fodder yields for the winter became much smaller. This combined with regular herd culling made it hard to maintain livestock, especially for the poorest of the Greenland Norse. In spring, the voyages to where migratory harp seals could be found became more dangerous due to more frequent storms, and the lower population of harp seals meant that Nordrsetur hunts became less successful, making subsistence hunting extremely difficult. The strain on resources made trade difficult, and as time went on, Greenland exports lost value in the European market due to competing countries and the lack of interest in what was being traded. In addition, it seemed that the Norse were unwilling to integrate with the indigenous Thule of Greenland, either through marriage or culture. There is evidence of contact as seen through the Thule archaeological record including ivory depictions of the Norse as well as bronze and steel artifacts. However, there is essentially no material evidence of the Thule among Norse artifacts. In older research it was posited that it was not climate change alone that lead to Norse decline, but also their unwillingness to adapt. For example, if the Norse had decided to focus their subsistence hunting on the ringed seal (which could be hunted year round, though individually), and decided to reduce or do away with their communal hunts, food would have been much less scarce during the winter season. Also, had Norse individuals used skin instead of wool to produce their clothing, they would have been able to fare better nearer to the coast, and wouldn't have been as confined to the fjords. However, more recent research has shown that the Norse did try to adapt in their own ways. Some of these attempts included increased subsistence hunting. A significant number of bones of marine animals can be found at the settlements, suggesting increased hunting with the absence of farmed food. In addition, pollen records show that the Norse didn't devastate the small forests and foliage as previously thought. Instead the Norse ensured that overgrazed or overused sections were given time to regrow and moved to other areas. Norse farmers also attempted to adapt. With the increased need for winter fodder and smaller pastures, they would self-fertilize their lands in an attempt to keep up with the new demands caused by the changing climate. However, even with these attempts, climate change was not the only thing putting pressure on the Greenland Norse. The economy was changing, and the exports they relied on were losing value. Current research suggests that the Norse were unable to maintain their settlements because of economic and climatic change happening at the same time. According to the Icelandic sagas—Eirik the Red's Saga, Saga of the Greenlanders, plus chapters of the Hauksbók and the Flatey Book—the Norse started to explore lands to the west of Greenland only a few years after the Greenland settlements were established. 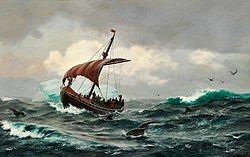 In 985, while sailing from Iceland to Greenland with a migration fleet consisting of 400–700 settlers and 25 other ships (14 of which completed the journey), a merchant named Bjarni Herjólfsson was blown off course, and after three days' sailing he sighted land west of the fleet. Bjarni was only interested in finding his father's farm, but he described his discovery to Leif Erikson who explored the area in more detail and planted a small settlement fifteen years later. 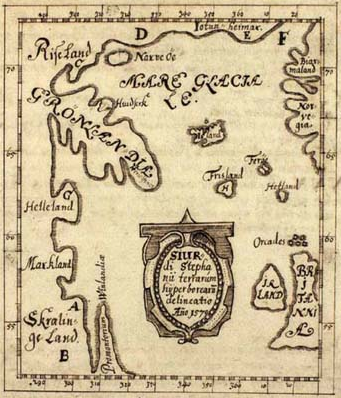 The sagas describe three separate areas discovered during this exploration: Helluland, which means "land of the flat stones"; Markland, "the land of forests", definitely of interest to settlers in Greenland where there were few trees; and Vinland, "the land of wine", found somewhere south of Markland. It was in Vinland that the settlement described in the sagas was founded. Using the routes, landmarks, currents, rocks, and winds that Bjarni had described to him, Leif sailed from Greenland westward across the Labrador Sea, with a crew of 35—sailing the same knarr Bjarni had used to make the voyage. He described Helluland as "level and wooded, with broad white beaches wherever they went and a gently sloping shoreline." Leif and others had wanted his father, Erik the Red, to lead this expedition and talked him into it. However, as Erik attempted to join his son Leif on the voyage towards these new lands, he fell off his horse as it slipped on the wet rocks near the shore; thus he was injured and stayed behind. Leif wintered in 1001, probably near Cape Bauld on the northern tip of Newfoundland, where one day his foster father Tyrker was found drunk, on what the saga describes as "wine-berries." Squashberries, gooseberries, and cranberries all grew wild in the area. There are varying explanations for Leif apparently describing fermented berries as "wine." Leif spent another winter at "Leifsbúðir" without conflict, and sailed back to Brattahlíð in Greenland to assume filial duties to his father. In 1004, Leif's brother Thorvald Eiriksson sailed with a crew of 30 men to Vinland and spent the following winter at Leif's camp. In the spring, Thorvald attacked nine of the local people who were sleeping under three skin-covered canoes. The ninth victim escaped and soon came back to the Norse camp with a force. Thorvald was killed by an arrow that succeeded in passing through the barricade. Although brief hostilities ensued, the Norse explorers stayed another winter and left the following spring. Subsequently, another of Leif's brothers, Thorstein, sailed to the New World to retrieve his dead brother's body, but he died before leaving Greenland. In 1009, Thorfinn Karlsefni, also known as "Thorfinn the Valiant", supplied three ships with livestock and 160 men and women (although another source sets the number of settlers at 250). After a cruel winter, he headed south and landed at Straumfjord. He later moved to Straumsöy, possibly because the current was stronger there. A sign of peaceful relations between the indigenous peoples and the Norsemen is noted here. The two sides bartered with furs and gray squirrel skins for milk and red cloth, which the natives tied around their heads as a sort of headdress. There are conflicting stories but one account states that a bull belonging to Karlsefni came storming out of the wood, so frightening the natives that they ran to their skin-boats and rowed away. They returned three days later, in force. The natives used catapults, hoisting "a large sphere on a pole; it was dark blue in color" and about the size of a sheep's belly, which flew over the heads of the men and made an ugly din. The Norsemen retreated. Leif Erikson's half-sister Freydís Eiríksdóttir was pregnant and unable to keep up with the retreating Norsemen. She called out to them to stop fleeing from "such pitiful wretches", adding that if she had weapons, she could do better than that. Freydís seized the sword belonging to a man who had been killed by the natives. She pulled one of her breasts out of her bodice and struck it with the sword, frightening the natives, who fled. Purported runestones have been found in North America, most famously the Kensington Runestone. These are generally considered to be hoaxes or misinterpretations of Native American petroglyphs. There are many claims of Norse colonization in New England, none well-founded. The nineteenth-century Harvard chemist Eben Norton Horsford connected the Charles River Basin to places described in the Norse sagas and elsewhere, notably Norumbega. He published several books on the topic and had plaques, monuments, and statues erected in honor of the Norse. His work received little support from mainstream historians and archeologists at the time, and even less today. Settlements in continental North America aimed to exploit natural resources such as furs and in particular lumber, which was in short supply in Greenland. It is unclear why the short-term settlements did not become permanent, though it was likely in part because of hostile relations with the indigenous peoples, referred to as Skrælings by the Norse. Nevertheless, it appears that sporadic voyages to Markland for forages, timber, and trade with the locals could have lasted as long as 400 years. 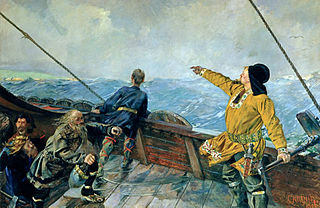 For centuries it remained unclear whether the Icelandic stories represented real voyages by the Norse to North America. The sagas first gained serious historic respectability in 1837 when the Danish antiquarian Carl Christian Rafn pointed out the possibility for a Norse settlement in, or voyages to, North America. North America, by the name Winland, first appeared in written sources in a work by Adam of Bremen from approximately 1075. The most important works about North America and the early Norse activities there, namely the Sagas of Icelanders, which were recorded in the 13th and 14th centuries. These Norse sites were also depicted in the Skálholt Map, made by an Icelandic teacher in 1570 and depicting part of northeastern North America and mentioning Helluland, Markland and Vinland. Evidence of the Norse west of Greenland came in the 1960s when archaeologist Anne Stine Ingstad and her husband, outdoorsman and author Helge Ingstad, excavated a Norse site at L'Anse aux Meadows in Newfoundland. The location of the various lands described in the sagas remains unclear, however. Many historians identify Helluland with Baffin Island and Markland with Labrador. The location of Vinland poses a thornier question. In 2012 Canadian researchers identified possible signs of Norse outposts in Nanook at Tanfield Valley on Baffin Island, as well as on Nunguvik, Willows Island, and Avayalik. Unusual fabric cordage found on Baffin Island in the 1980s and stored at the Canadian Museum of Civilization was identified in 1999 as possibly of Norse manufacture; that discovery led to more in-depth exploration of the Tanfield Valley archaeological site for points of contact between Norse Greenlanders and the indigenous Dorset people. Archeological findings in 2015 at Point Rosee, on the southwest coast of Newfoundland, were originally thought to reveal evidence of a turf wall and the roasting of bog iron ore, and therefore a possible 10th century Norse settlement in Canada. Findings from the 2016 excavation suggest the turf wall and the roasted bog iron ore discovered in 2015 were the result of natural processes. The possible settlement was initially discovered through satellite imagery in 2014, and archaeologists excavated the area in 2015 and 2016. Birgitta Linderoth Wallace, one of the leading experts of Norse archaeology in North America and an expert on the Norse site at L'Anse aux Meadows, is unsure of the identification of Point Rosee as a Norse site. Archaeologist Karen Milek was a member of the 2016 Point Rosee excavation and is a Norse expert. She also expressed doubt that Point Rosee was a Norse site as there are no good landing sites for their boats and there are steep cliffs between the shoreline and the excavation site. In their November 8, 2017, report Sarah Parcak and Gregory Mumford, co-directors of the excavation, wrote that they "found no evidence whatsoever for either a Norse presence or human activity at Point Rosee prior to the historic period" and that "None of the team members, including the Norse specialists, deemed this area as having any traces of human activity." ^ Pálsson, Hermann (1965). The Vinland sagas: the Norse discovery of America. Penguin Classics. p. 28. ISBN 0-14-044154-9. Retrieved 2010-04-15. ^ Fitzhugh, William W, ‘Vikings: The north Atlantic saga’, Anthronotes museum of natural history publication for education, available at www.anthropology.si.edu. ^ He remained there making explorations for three years and decided to found a settlement there ( Anderson, Rasmus B. (February 18, 2004) . Hare, John Bruno (ed.). "Norse voyages in the tenth and following centuries". The Norse Discovery of America. Retrieved 2008-08-27. ). ^ Reeves, Arthur Middleton; Anderson, Rasmus B. (1906). "Discovery and colonization of Greenland". Saga of Erik the Red. Retrieved 2008-08-27. The first winter he was at Eriksey, nearly in the middle of the eastern settlement; the spring after repaired he to Eriksfjord, and took up there his abode. He removed in summer to the western settlement, and gave to many places names. He was the second winter at Holm in Hrafnsgnipa, but the third summer went he to Iceland, and came with his ship into Breidafjord. ^ a b c d e f g Wernick, Robert; The Seafarers: The Vikings, (1979), 176 pages, Time-Life Books, Alexandria, Virginia: ISBN 0-8094-2709-5. ^ Lynnerup, N (2014). "Endperiod Demographics of the Greenland Norse". Journal of the North Atlantic. 7 (sp7): 18–24. doi:10.3721/037.002.sp702. ^ a b c Wahlgren, Erik (1986). The Vikings and America. New York: Thames and Hudson. ISBN 0-500-02109-0. ^ Stockinger, Günther (10 January 2012). "Archaeologists Uncover Clues to Why Vikings Abandoned Greenland". Der Spiegel Online. Retrieved 12 January 2013. ^ a b c d e f g h i j Pringle, Heather (1997-02-14). "Death in Norse Greenland". Science. 275 (5302): 924–926. doi:10.1126/science.275.5302.924. ISSN 0036-8075. ^ a b c d e f g h i j k Dugmore, Andrew J.; McGovern, Thomas H.; Vésteinsson, Orri; Arneborg, Jette; Streeter, Richard; Keller, Christian (2012). "Cultural adaptation, compounding vulnerabilities and conjunctures in Norse Greenland". Proceedings of the National Academy of Sciences of the United States of America. 109 (10): 3658–3663. doi:10.1073/pnas.1115292109. JSTOR 41507015. PMC 3309771. ^ a b c d e f g h Berglund, Joel (1986). "The Decline of the Norse Settlements in Greenland". Arctic Anthropology. 23 (1/2): 109–135. JSTOR 40316106. ^ a b c d e f g h i McGovern, Thomas H. (1980). "Cows, Harp Seals, and Churchbells: Adaptation and Extinction in Norse Greenland". Human Ecology. 8 (3): 245–275. doi:10.1007/bf01561026. JSTOR 4602559. ^ McGovern, Thomas H. (1991). "Climate, Correlation, and Causation in Norse Greenland". Arctic Anthropology. 28 (2): 77–100. JSTOR 40316278. ^ a b c d e "Why did Greenland's Vikings disappear?". Science | AAAS. 2016-11-07. Retrieved 2018-03-05. ^ "The Fate of Greenland's Vikings - Archaeology Magazine Archive". archive.archaeology.org. Retrieved 2018-03-06. ^ Sephton, J. (1880). "The Saga of Erik the Red". Icelandic Saga Database. Retrieved 2010-08-11. ^ a b c Magnusson, Magnus; Palsson, Hermann (1965). The Vinland Sagas. Penguin Books. ISBN 978-0-14-044154-3. ^ Robin Fleming (1995). "Picturesque History and the Medieval in Nineteenth-Century America". The American Historical Review. 100 (4): 1079–82. doi:10.1086/ahr/100.4.1061. JSTOR 2168201. ^ Eben Norton Horsford; Edward Henry Clement (1890). The discovery of the ancient city of Norumbega: A communication to the president and council of the American Geographical Society at their special session in Watertown, November 21, 1889. Houghton, Mifflin. p. 14. Retrieved 1 September 2011. ^ "Did Leif Erikson once live in Cambridge, Massachusetts?". The Straight Dope. Retrieved 2009-02-10. ^ Steven Williams, Fantastic Archaeology: The Wild Side of North American Prehistory, 1991. ^ Murrin, John M; Johnson, Paul E; McPherson, James M; Gerstle, Gary (2008). Liberty, Equality, Power: A History of the American People, Compact. Thomson Wadsworth. p. 6. ISBN 978-0-495-41101-7. Retrieved 2010-11-24. ^ Schledermann, Peter. 1996. Voices in Stone. A Personal Journey into the Arctic Past. Komatik Series no. 5. Calgary: The Arctic Institute of North America and the University of Calgary. ^ Sutherland, Patricia. 2000. “The Norse and Native Norse Americans”. In William W. Fitzhugh and Elisabeth I. Ward, eds., Vikings: The North Atlantic Saga, pp. 238–47. Washington, DC: The Smithsonian Institution. ^ Ingstad, Helga; Ingstad, Anne Stine (2001). The Viking Discovery of America: The Excavation of a Norse Settlement in L'Anse Aux Meadows, Newfoundland. Facts on File. p. 111. ISBN 978-0816047161. Retrieved 11 December 2016. ^ Pringle, Heather (19 Oct 2012). "Evidence of Viking Outpost Found in Canada". National Geographic News. National Geographic Society. Retrieved 2013-01-28. ^ Pringle, Heather (November 2012). "Vikings and Native Americans". National Geographic. 221 (11). Retrieved 2013-01-28. ^ The Nature of Things (22 Nov 2012). "The Norse: An Arctic Mystery". CBC Television. Retrieved 2013-01-29. ^ Sutherland, Patricia (2000). "Strands of Culture Contact: Dorset-Norse Interactions in the Canadian Eastern Arctic". In Appelt, Martin; Berglund, Joel; Gulløv, Hans Christian (eds.). Identities and Cultural Contacts in the Arctic: Proceedings from a Conference at the Danish National Museum, Copenhagen, November 30 to December 2, 1999. Copenhagen, Denmark: The Danish National Museum & Danish Polar Center. pp. 159–169. Retrieved December 19, 2018. ^ "Strangers, Partners, Neighbors? Helluland Archaeology Project: Recent Finds". Canadian Museum of History. Retrieved December 19, 2018. ^ a b Bird, Lindsay (May 30, 2018). "Archeological quest for Codroy Valley Vikings comes up short - Report filed with province states no Norse activity found at dig site". CBC. Retrieved June 18, 2018. ^ a b McKenzie-Sutter, Holly. "No Viking presence in southern Newfoundland after all, American researcher finds". The Canadian Press. Retrieved June 18, 2018. ^ a b Strauss, Mark (March 31, 2016). "Discovery Could Rewrite History of Vikings in New World". National Geographic. Sarah Parcak, a National Geographic Fellow and “space archaeologist” who has used satellite imagery to locate lost Egyptian cities, temples, and tombs […] supported, in part, by a grant from the National Geographic Society […] led a team of archaeologists to Point Rosee last summer  to conduct a “test excavation,” a small-scale dig to search for initial evidence that the site merits further study. ^ Barry, Garrett (April 1, 2016). "Potential Viking site found in Newfoundland". CBC. ^ Bird, Lindsay (September 12, 2016). "On the trail of Vikings: Latest search for Norse in North America". CBC. ^ Parcak, Sarah; Mumford, Gregory (November 8, 2017). "Point Rosee, Codroy Valley, NL (ClBu-07) 2016 Test Excavations under Archaeological Investigation Permit #16.26" (PDF). geraldpennyassociates.com, 42 pages. Retrieved June 19, 2018. [The 2015 and 2016 excavations] found no evidence whatsoever for either a Norse presence or human activity at Point Rosee prior to the historic period. … None of the team members, including the Norse specialists, deemed this area as having any traces of human activity. Wikimedia Commons has media related to Norse colonization of the Americas. Helge Marcus Ingstad was a Norwegian explorer. After mapping some Norse settlements, Ingstad and his wife Anne Stine, an archaeologist, in 1960 found remnants of a Viking settlement in L'Anse aux Meadows in the province of Newfoundland in Canada. They were thus the first to prove conclusively that the Icelandic/ Greenlandic Norsemen such as Leif Erickson had found a way across the Atlantic Ocean to North America, roughly 500 years before Christopher Columbus and John Cabot. He also thought that the mysterious disappearance of the Greenland Norse Settlements in the 14th and 15th centuries could be explained by their emigration to North America. Thorvald Eiriksson was the son of Erik the Red and brother of Leif Erikson. The only Medieval Period source material available regarding Thorvald Eiriksson are the two Vinland sagas; the Greenland Saga and the Saga of Erik the Red. Although differing in various detail, according to both sagas Thorvald was part of an expedition for the exploration of Vinland and became the first European to die in North America. Anne Stine Ingstad was a Norwegian archaeologist who, along with her husband Helge Ingstad, discovered the remains of a Viking (Norse) settlement at L'Anse aux Meadows in the Canadian province of Newfoundland and Labrador in 1960. Thorfinn Karlsefni was an Icelandic explorer. Around the year 1010 AD, he followed Leif Eriksson's route to Vinland, in a short-lived attempt to establish a permanent settlement there with his wife Guðríður Víðförla Þorbjarnardóttir and their followers. The Vinland Sagas are two Icelandic texts written independently of each other in the early 13th century — The Saga of the Greenlanders and The Saga of Eric the Red,. The sagas were written down between 1220 and 1280, much later than the initial time of action 970–1030. L'Anse aux Meadows is an archaeological site on the northernmost tip of the Great Northern Peninsula on the island of Newfoundland in the Canadian province of Newfoundland and Labrador. 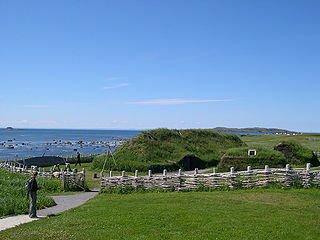 Archaeological evidence of a Norse presence was discovered at L'Anse aux Meadows in the 1960s. It is the only confirmed Norse or Viking site in North America outside of the settlements found in Greenland. Íslendingur is a replica of the Gokstad viking ship and was sailed across the Atlantic Ocean in 2000. It is on display at the Viking World museum in Njarðvík, Reykjanesbær, Iceland. Point Rosee, previously known as Stormy Point, is a headland near Codroy at the southwest end of the island of Newfoundland, on the Atlantic coast of Canada.